Illicit drug use in California is higher than the national average, though not quite amongst the states with the very worst incidences of drug abuse. 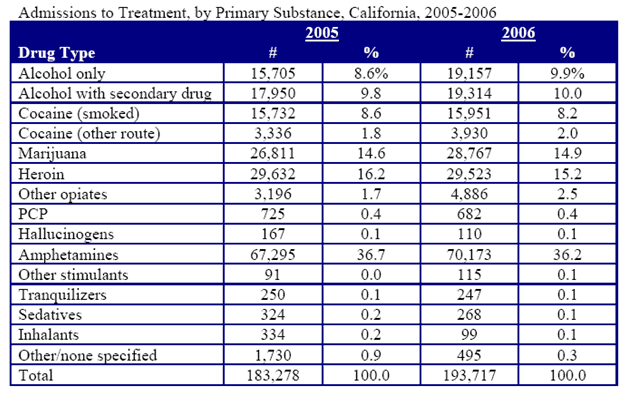 California does have a strong infrastructure of alcohol and drug abuse treatment facilities and centers. There are nearly 2000 California drug abuse rehabilitation facilities in the state. This count only includes those that have been certified and or recognized by the state of California. This number has risen steadily along the years. Seven new facilities operated by the federal government and two by tribal governments were opened between 2002 and 2006. California drug and alcohol rehab centers do provide both inpatient and outpatient treatment programs. More than 40% of all facilities provide residential care and 132 California drug rehab centers offer methadone treatment. Nearly 1000 doctors have the certification necessary to provide Buprenorphine therapy. Over 1000, or 63% of California rehab centers do receive some type of funding. 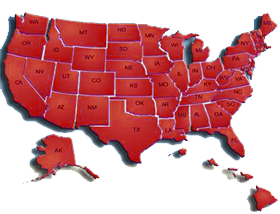 This may come from the local government or from the county, state or federal government agencies. Twenty-six percent of all of the drug rehab centers in California do have some type of contract with a managed care organization for treatment. Individuals who enroll in some type of California alcohol drug rehab program most often need help beating an alcohol addiction. Heroine is next, followed by cocaine, marijuana and then meth. Over the last decade, fewer people are admitting to having problems with heroine, alcohol and cocaine when they seek treatment. Conversely, there has been an increase in the admissions of marijuana and meth use. In fact, meth has been responsible for the sharpest increase of California drug and alcohol rehab treatment. California ranks highly amongst states that have a large percentage of individuals that need treatment for alcohol and drug abuse but who aren’t receiving it. This is a serious problem and California alcohol and drug rehabilitation facilities are working hard to address it. If individuals are unable to receive treatment but require it, this poses a host of potential dangers for the state of California and its’ residents. An increase in government funded and non-profit California drug rehab centers can be very effective in addressing this problem. If more people have the option of affordable and free treatment, the likelihood that an increased number of individuals would seek treatment increases. It is important to note that some people will simply refuse to seek treatment because they haven’t yet come to terms with their addiction. Until they do, they will simply avoid any type of rehabilitation. Drug abuse rehabilitation facilities won’t be ale to help these individuals until they realize that they are addicts or unless they are court appointed to get enter a California rehab facility.